Life is a balancing act, but Dave and Sherry Johnson have found what they’ve been looking for in Cuenca, Ecuador. Before his first exploratory trip, Dave imagined a Third World country with old, worn-out buses, chickens and cargo hanging from every inch, and people riding on the roof. 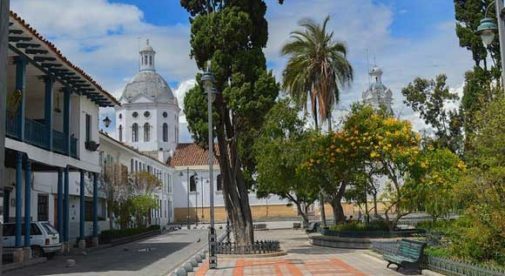 What he found instead when he arrived in Cuenca a year-and-a-half ago was a charming colonial city with cobblestone streets, wrought-iron balconies, majestic churches, and friendly people. And Dave’s first bus ride wasn’t at all like he had imagined; it was a Mercedes bus that he says was more lavish than most airplanes he has been on. Having come from a military background, Dave has lived all around the world—England, Turkey, Spain, and Italy—so there weren’t too many surprises for him in Cuenca. But what he did find was the entire package of everything he loves the most…warm-natured people, sweeping mountain views, trendy restaurants, and a temperate climate. The spring-like temperatures of Cuenca are a great fit for Dave and Sherry. Dave is originally from Maine and in an attempt to escape the harsh winters, they moved to Asheboro, North Carolina. After celebrating their 24th wedding anniversary, they decided to move to Cuenca where the weather is just about as perfect as it gets. Dave and Sherry didn’t come to Cuenca for economic reasons, as Asheboro is an inexpensive place to live, instead what attracted them to this city was the alluring lifestyle. 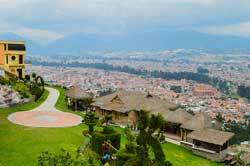 Dave and Sherry were drawn to Cuenca for its alluring, stress-free lifestyle and great climate. Sherry and Dave aren’t yet retired. Dave has been in advertising, marketing, and publishing his entire career and from the comfort of their home in Cuenca they publish a magazine in Asheboro, North Carolina, as well as the first glossy-print expat magazine in Cuenca, Ecuador. While his workload has actually increased, his stress has been reduced. “There’s something about the mountain air and the tranquilo way of life that makes it hard to get stressed out,” says Dave. Dave admits that he sometimes gets frustrated when he tries to find a taxi and after an inordinate amount of time, finds a fleet of taxis parked in a local field while the drivers are playing soccer or basketball. He smiles and then remembers why he came here in the first place. “Ecuadorians really seem to have a work/life/play balance that would be construed as laziness in the U.S. Working 80 hours a week would be considered insanity in Ecuador instead of a badge of courage as it is in the U.S.,” Dave explains. Dave and Sherry have finally found the work-life balance in Ecuador and until adventure calls them to the next destination…Cuenca is home.